If your Android is low on memory or running slow, you must consider cleaning it. Cleaning Android is a great way to boost your phone’s performance. Cleaning your Android not only makes it work better, but it also removes junk files and improves battery life as well. Doing this manually could waste your invaluable time and the process would not be that effective. Installing a cleaning app on your Android can help you get rid of junk, cache files and can also enhance the performance of your device. What is Android Cleaner Application? Android Cleaning app is a utility tool which helps you optimize your device in little time. With a tap on a screen, your device’s junk files, useless data, and caches are deleted. As a result, it enhances your device performance. There are a lot of Android Cleaning apps available on Google Play Store. 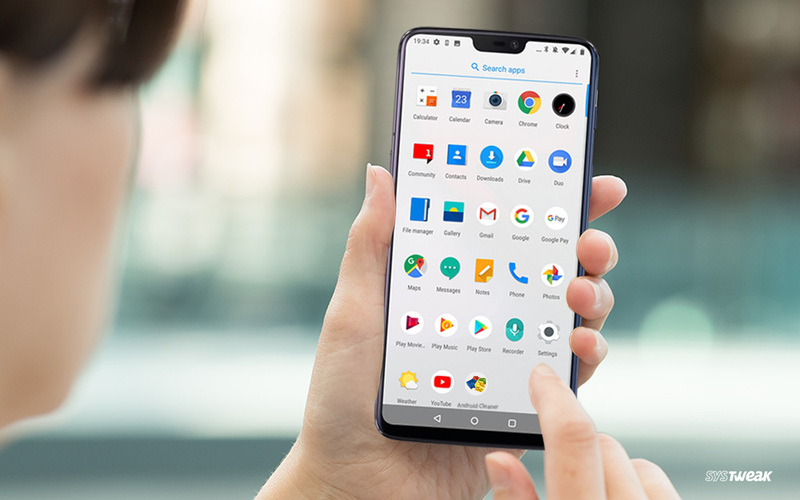 If you are confused and don’t know which one to get for your Android, check this list of best cleaner apps for Android to reach a decision. The app helps in improving gaming experience by freeing precious space on RAM and device. When have low space, the WhatsApp module feature, you can view all the sent, received files, audio/video files at one place & delete the undesired ones to enhance device performance. The hidden module lets you view, archive, rename and delete hidden files stored on your device. This mobile cleaner allows you to set schedule to clean your device regularly. Also, it has a hibernation module which optimizing battery life by hibernating apps, not in use. One of the best cleaner apps for Android, CCleaner helps you to remove application cache, clean RAM, reclaim space, and browse safely. It allows you to uninstall unwanted applications easily. Let’s have a look at the features of CCleaner. It cleans download folders, application cache, browser history, and more. It gets rid of obsolete and leftover files of apps. It allows you to check which app is using u your data. This cache cleaner for Android can tell you which apps are draining the battery, along with unused apps. With all this, you get to clean your RAM with Task Killer. Also, it comes with hibernation feature which will stop apps running in the background till then you open it again. It cleans up RAM and optimizes Android speed by cleaning unnecessary background tasks. It removes residual files, obsolete apks, cache and temp files. It runs a scan on installed apps, new apps and content on a memory card. This memory cleaner For Android also acts as Network Booster, it detects network status, such as download speed, networking devices, Wi-Fi security, and more. Also, it has a CPU Cooler feature which can detect and clean apps to avoid overheating. The tool acts as junk cleaner as it removes residual, junk and cache files which makes your phone slow. It scans apps installed for blocking and removing virus, and other online threats. It comes with Photo Vault, to hide your personal photos. Besides this, it also has Applock to protect your apps. Clean Master is a mobile cleaner app which can also identify fake Wi-Fi and safeguards your device from unsecured Wi-Fi networks. The tool also comes with battery saver feature which hibernates running apps to optimize battery life. It is a cache cleaner for Android which can clean junk, cache and residual files to recover storage space. It has an ability to optimize Android memory and processor. It gives you an option to uninstall undesired apps. Besides from being a memory cleaner for Android, 360° Booster & Cleaner can act as a battery saver app which closes the unwanted background processes and augment battery charging. It also avoids overheating of the device whilst cleaning processes. With Blackhole booster, the app stops stubborn auto-start apps, effectively. It comes with AppLock, so keep your private apps secured from the prying eyes. You can also get rid of pre-installed apps with a single tap. Go Speed is one of the best junk cleaners for Android which recovers space by deleting residual files, temp files, and other unwanted files. The APP manager of the app helps you create backups and uninstall rarely used apps. It comes with advanced junk cleaner engine which cleans junk, cache and other residual files. It cleans phone storage and memory in a single tap. It comes with advanced memory cleaner which optimizing storage. Power Clean is a mobile cleaner app which boost your Android device speed and removes e uninstalled APK files. It removes duplicate photos from your device. It removes residual , Cache, RAM junk, APK files and junk files from your smartphone. It boosts all auto start apps in a single tap to optimize your apps performance along with system performance. It helps you manage notifications in one tap. Ace Cleaner is a perfect cleaner for Android phone as it helps in uninstalling unwanted apps from your phone. Also, it offers app lock to protect your private apps. Also, it scans and deletes duplicate photos from your Android. It speeds your smartphone or tablet with memory cleaner as it clears cache and uninstalls unwanted apps and recovers space. It also has an Applock which protects your sensitive apps. The game booster makes your games run fast and improve overall game performance. The Cleaner has a beautiful design and is a lightweight app which doesn’t take a toll on your Android’s storage. It also removes junk files, cache files and obsolete APK files. It uses algorithm technique which efficiently closes background processes along with stealthy running apps. It removes video junk, photo junk, system junk, cache and residual files as well. This boost the speed and performance of your device. It also acts a battery saver as it stops unwanted apps from running. Cleaner – Boost, Clean, Space Cleaner is a memory cleaner for Android which kills heavy resource consuming apps to avoid overheating. The app has an anti-virus database which offers security against malware, trojans and other malicious threats. It comes with phone memory optimizer and it makes your device run smoother and faster. The app also offers app lock feature, which enables you to lock your private apps. HI Cleaner is a mobile cleaner app which secures your Android device from insecure Wi-Fi and phishing hotspot. The tool comes with user friendly interface and is light weight on system resources. It helps you to get rid of preinstalled unwanted apps. It deletes old files, uninstalls apps, removes unwanted photos and videos as well. It removes junk, clear caches files and detects apps which are slowing down device. AVG Cleaner and Battery Booster helps in enhancing battery life by hibernating apps not in use. It also captures system information and displays it one screen. It declutters storage space by cleaning junk files and works as app cache cleaner. It speeds up the slow performance of your Android as well. You can uninstall apps and manage your SD card. All-in-One Toolbox boosts charging speed, helps avoid overheating and keeps your privacy intact. It also comes with photo compression feature which recovers more space on your device. Apart from cleaner, Norton also acts a security app which scans and remove apps which have malware, spyware, or Android virus which could hamper speed of your device. It helps you speed up Android by uninstalling unnecessary apps. Norton helps your Android to stay safe when connecting to public Wi-Fi by alerting you if a connection is not safe. It also has call blocking feature which can block spam and junk calls. It shows network activity along with Disk I/O activity. It provides file browser which supports basic operations such as cut, copy, paste, delete. Simple System Monitor allows you to view temperatures of all thermal zones and shows you battery health & temperature of your device. It can also kill processes on Rooted devices. So, these are the best cleaning apps for Android which can be used to enhance the performance of your device. How Do I Deep Clean My Android Phone? If your Android device is running sluggish, deep-cleaning could do wonders. Whether you have 32GB, 64GB or 256GB storage on your device, it gets filled with time. If you are restoring a backup of an old device, then it could load the data and apps that you no longer use. Even if you don’t restore a backup, photos from your social media accounts get collected. The Google Photos is one of the examples of it. Its photo upload method shows you all the photos every uploaded as and when you have an internet connection. Furthermore, with time, there are downloaded files from various mediums, which uses GBs of your phone storage. Therefore, your device will be overloaded with unwanted data, along with cache files created by apps and they have to manage all the things simultaneously. Soon, you will get low on storage warning and slow running Android. Therefore, you need to deep clean Android device. You need to look for unwanted files, photos, apps and music files and have to get rid of them. Moreover, need to remove cache files. Doing it manually could drain you and the process is also not efficient. So, using a third-party app can help you manage device storage and enhance device performance. What Are Junk Files On Android? Junk Files are mainly the temporary files including residual files, cache files, temporary files, which gets created by running apps or installing apps. These files are of short-term use and left behind once the work is done. Over the time, all these files pile up and hog the disk space on a device. How Can I Speed Up My Android? To boost the speed of an Android smartphone, you need to remove unwanted apps, unwanted data and cache files from your device. Performing the action manually can be cumbersome and inefficient. There can be various ways of doing it. You need to clear Cache files. For that, locate Settings from the home screen. Navigate To Storage and click Cached Data. You will get a prompt to clear Cache, click OK and it is done. Locate Settings from the home screen. Go To Apps & scroll the list and check for unwanted apps. Once you know which app to delete, tap on it. You will get another screen, click Uninstall. It will ask to confirm, press OK.
Repeat steps until all the unwanted apps are removed. Tap Build Number option seven times to enable developer options. Go back to Settings & Navigate To Developer Options. Look For Windows animation scale and tap on “Animation off”. These methods work to enhance the performance of your Android however, sometimes these alone can’t make it work. Therefore, you need Cleaner for Android phones. Which Is The Best Free Cleaning App For Android? If you are still not able to understand which cleaning app could be best for you, then we can suggest you two of the most efficient apps available on Google Play Store. One of them is Systweak Android Cleaner and other is CCleaner. You can choose either of the two to clean Cache files, remove junk and residual files. They both can optimize your battery by hibernating unused apps on your Android phone. Any of the two could help boost your device performance along with increased speed. However, you can also choose any of the above listed apps to clean and optimize your Android by distinguishing features of the apps.